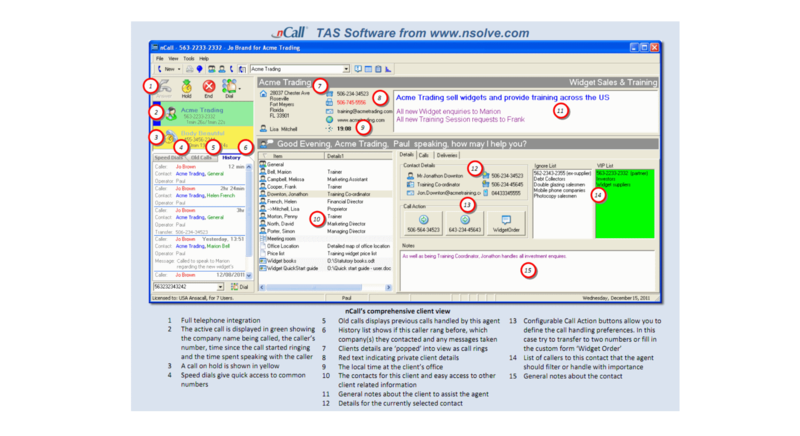 nCall is the definitive software solution for telephone answering services and virtual receptions. nCall is the most advanced dedicated telephone answering service software solution available, and has been used all over the world for the past 15 years. All the information your operators need to answer a call professionally is available immediately through clever client ‘popping’. nCall will improve user efficiency and increase business profitability, with operators able to answer more calls and take more messages in less time, and with fewer mistakes too! With powerful messaging tools, and deep billing scheme customisation, nCall offers the complete answering service software package. nCall is also cloud hosting compatible for a minimal hardware setup. Host the nCall Server and Database in the a virtual server, and integrate with a hosted PBX for low maintenance solution. There is much more to nCall – we highly recommend you get in touch for a full demonstration, or read the full feature list. There is also a comprehensive screenshot slideshow below! Our most recent 2018 customer survey demonstrated nCall’s exceptional value for money – find out more here. 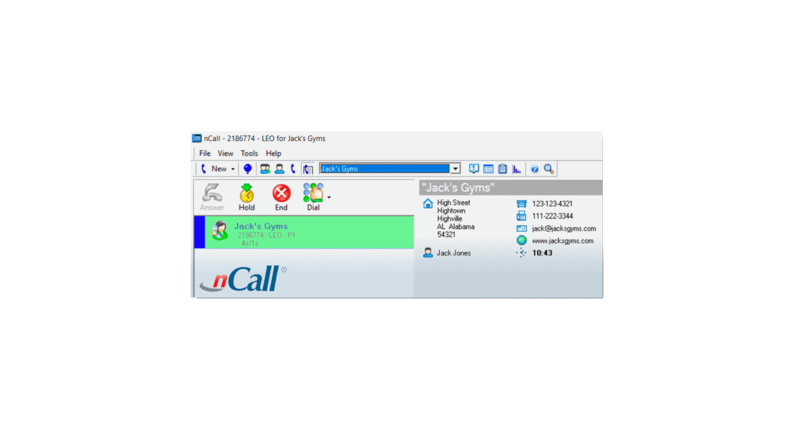 nCall fully integrates with your telephone system or VOIP handset to automatically 'pop' new calls on your screen along with client records and important information. 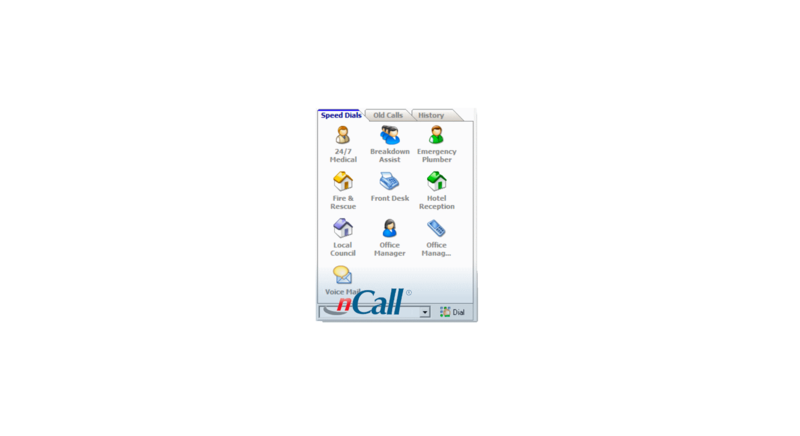 The nCall dashboard allows operators to remained focused and handle the call within nCall. When a call is answered, all necessary client information is at your fingertips including their preferred greeting, a list of relevant contacts and quick links to forms and information that may be needed to handle the call. 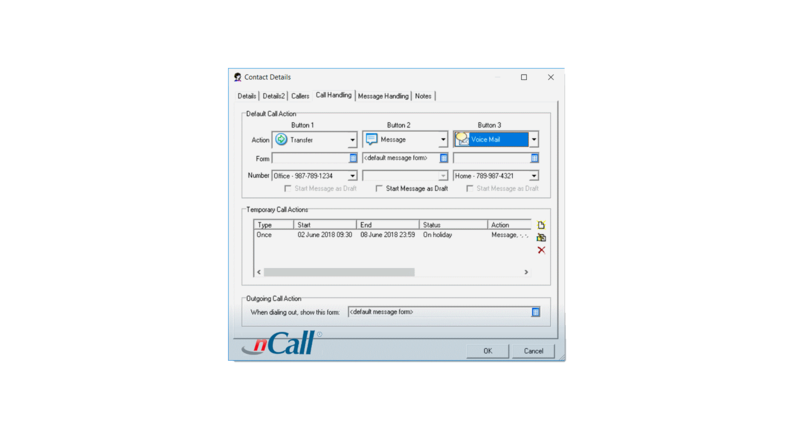 Call handling options can be configured per contact to give your clients complete control and flexibility, rather than having to conform to a default global setting. 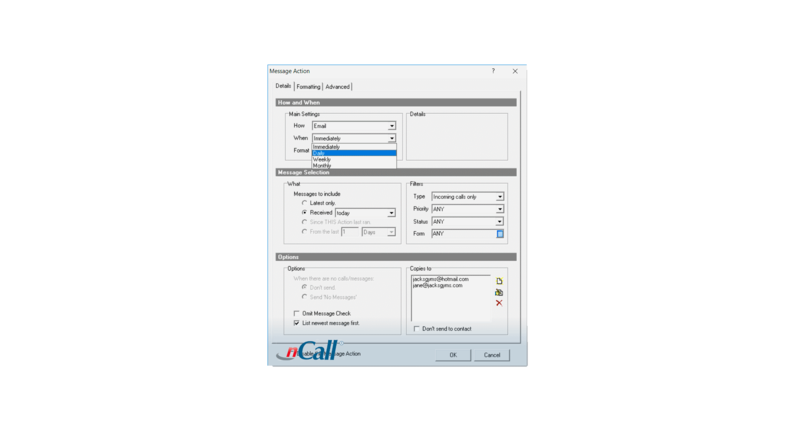 Take messages with ease in nCall with pop-up forms that can be customised per client. Delivery is automatically handled based on the clients message action preferences. A full history of sent messages is saved and recorded in nCall for quality control and reporting purposes. Each contact can have an unlimited number of message delivery options. 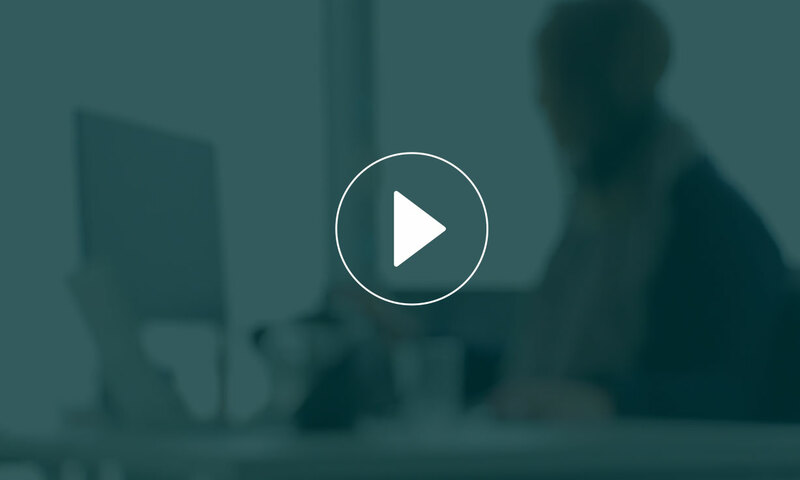 Each message action allows your client to specify how, when and what is sent. For example, your client may want each message sent via SMS as soon as they're taken, as well as a summary email with all the day's messages sent each afternoon at 5pm. 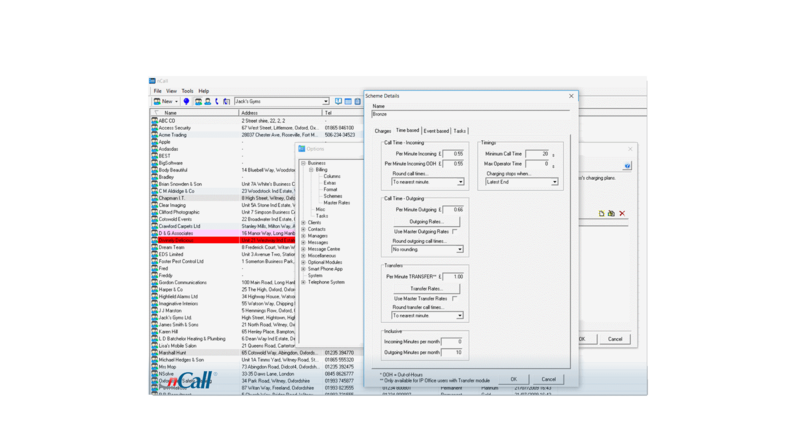 nCall includes a customisable speed dial to save operators valuable time when handling an urgent query. 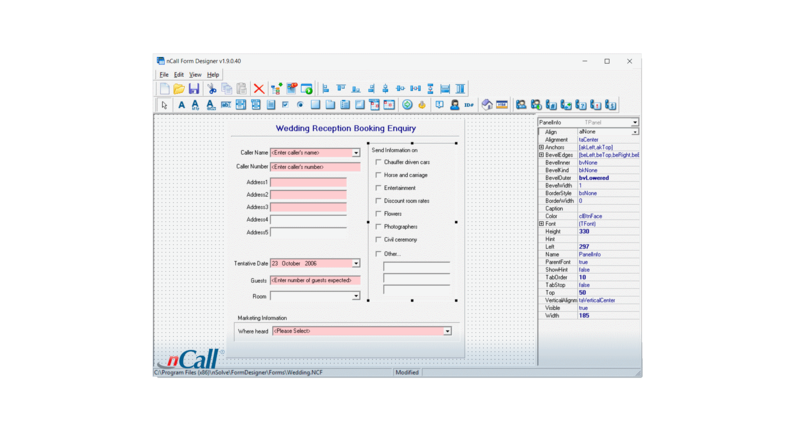 Any number of different forms are easily created using nCall's powerful Form Designer. Make sure you're gathering the essential information required by each of your clients. 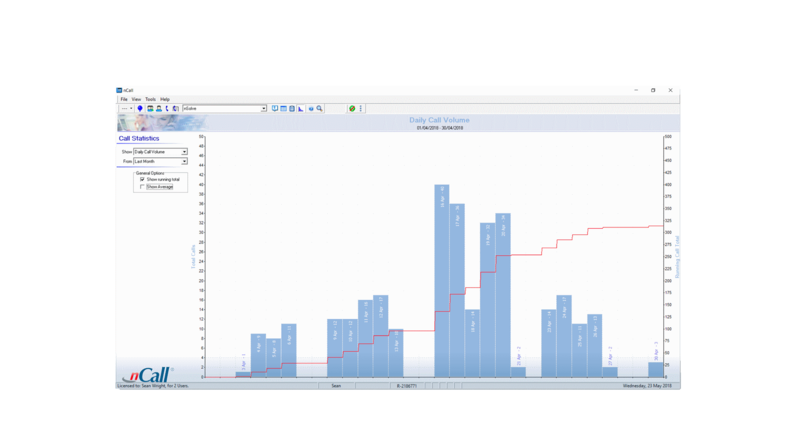 Numerous call analytics are recorded and presented on a dedicated statistics page within nCall. You can create numerous billing schemes (pricing structures) that can be assigned to your clients. nCall can then create detailed billing reports that can be easily exported to a spreadsheet to be used with your chosen billing software package. Incoming calls 'pop' on screen along with button prompts to answer, put on hold and end the call. Your client's desired greeting will also appear before you even answer the call. nCall is a client-server program that consolidates the various components that make up an answering service and delivers them in a single easy-to-use application that connects to a core server. The nCall Server can be installed on a user’s PC, a dedicated Windows server, or hosted in a virtual environment. Using TAPI telephone system integration, nCall ‘pops’ the correct client information on screen by identifying the number the caller dialled. This allows operators to answer the call immediately, and with absolute professionalism. At the core of nCall is a powerful database able to store millions of calls, and thousands of client records, providing telephone answering services the confidence to grow without reaching any system limits. nCall has been iterated on for over 15 years, with customer feedback being our primary focus. We welcome suggestions and requests from any customer – big or small – and do our best to accommodate everyone without compromising the core product. We’re also continuously looking ahead at advancements in telephony technology to make sure we’re providing the best possible product to answering services worldwide. nCall communicates with your phone system via TAPI or, if deploying a hosted VoIP PBX, via your IP handsets. Whilst we don’t recommend any particular telephone systems or handsets to our customers, we’re happy to let you know what nCall is currently compatible with. Please get in contact with the nSolve team if you’d like to speak to us about phone system integration. You’ve seen enough, and would like a demonstration?